MapInfo Pro is a powerful mapping and geographic analysis application. By visualising the relationships between data and geography, MapInfo Pro makes it fast and easy to create, share and use maps by turning data into information. MapInfo Pro supports a range of data formats including many common PC file formats (such as Microsoft Excel, Access, DBF and CSV files), relational and spatial database formats (Oracle, Microsoft SQL Server, PostGIS, SQLite and ODBC compliant databases), and spatial data formats ( AutoCAD DXF/DWG, SHP, DGN and more). You can also use imagery (aerial images, satellite images, scanned paper maps, etc.) of almost any format in your maps. And MapInfo Pro includes access to Microsoft Bing aerial and hybrid maps as standard. With MapInfo Pro you can access a vast selection of CAD data creation and editing tools as well as edit tabular data like values and names. MapInfo Pro allows you to make changes to all your maps and data in a single application, saving you time and effort. MapInfo Pro’s simple-to-use map display wizards and detailed customisation options allow users of all skill levels to create great looking maps quickly. Load image data sets as background mapping and overlay your point, line and polygon data to visualise your data in the way you want. Change the style and appearance of any data set using our powerful analytical processes and display customisation techniques. MapInfo Pro makes communicating your results easy, thanks to its wide range of data sharing and publishing options. Print or publish maps of any size with legends and charts through simple-to-use wizards so you can share your results with everyone you need to. For sharing data you can save or export it to many commonly used formats. 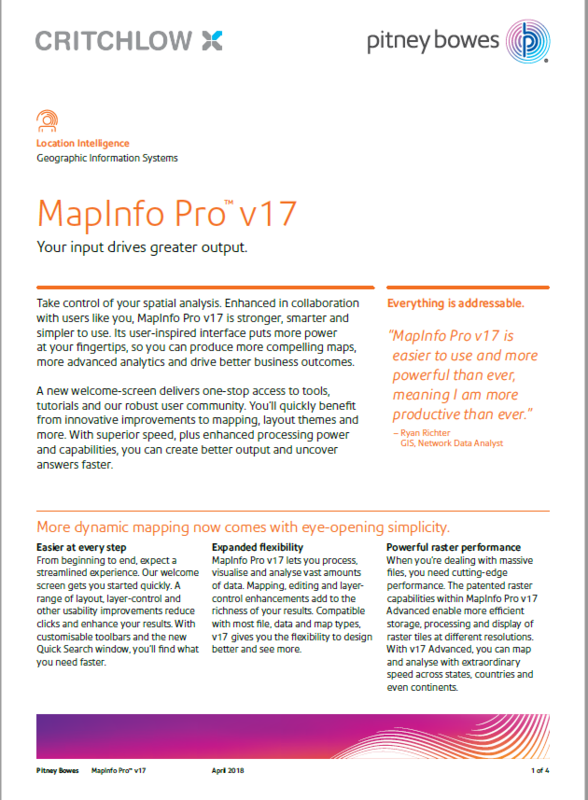 Are you using an older version of MapInfo Pro? Download a free trial of the latest version. MapInfo Pro, optimised for 64-bit processing, offers critical capabilities needed by most GIS professionals, and with the v16 release, is even more accessible. Want to know why MapInfo Pro is the most intuitive mapping and GIS application?